CTA has a long tradition of supporting ACP agricultural and rural development institutions to improve management of their information and communication processes, and is now engaging ACP institutions to support integrated knowledge management both at organisational level and within their networks. During the month of November, CTA held a #KNOWvember campaign with a series of training workshops and an expert consultation. This came hot on the heels of the Open Access Week celebrated in October and at CTA, #KNOWvember was preceded by the expert consultation on facilitating the convergence of ICT channels for agriculture (29th-31st October), addressing the challenges with accelerating the process of adoption, uptake and upscaling of ICTs for extension and advisory services, value chains development, ARD policy processes, climate change resilience and nutrition security. In September 2013, CTA organized an Expert Consultation in Ede, The Netherlands, to consider the development of structured short courses on knowledge management (KM) in agricultural and rural development (ARD). The findings of the consultation led, in 2014, to drafting of curriculum outlines, preparation of training materials and proposed course contents, which were tested in the first half of November 2014. The first course piloted was an introduction to KM for ARD and the training brought together participants from CTA partner organisations in the ACP; FARA, IICA, CORAF-REGICA, CGIAR, SPC-PAFPNET, ITOCA, CCARDESA, AFAAS, ASARECA, CAP-FIDA (Madagascar) and CaFAN. 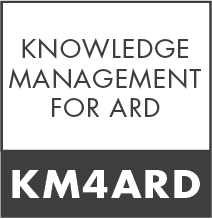 These were KM practitioners in development organisations with a role in organisational KM and knowledge sharing (KS) with a network of stakeholders, staff of ARD in the ACP countries, as well as regional and international ARD organisations. Overall, the workshop helped participants to better conceptualize knowledge sharing, engage with and share what is being done to facilitate knowledge management and what can be done to foster networking and problem solving through KM tools. Participants provided feedback on the course content for their colleagues and staff as potential learners and how the course can also cater for extension and technical staff in ACP organisations. The revised contents of the course will be available in early 2015. Running the pilot introduction to KM course, highlighted the need for a short complementary awareness course targeted at senior management of ARD institutions which would enhance engagement of ACP institutions in adopting good KM practices, foundations of which are offered by the introductory course. Enter, the second course which was piloted in the following week: the ‘KM for Senior Management in ARD (KM4SMARD)’ course was targeted at Senior staff and management of Agricultural and Rural Development (ARD) institutions, who need to understand and lead interventions to address information management and knowledge exchange. The course exposed participants to key principles and strategies of KM, enabling them to plan, initiate or even lead KM activities within their own organization or network. The structure of the programme served to take participants on a journey to examine how knowledge management could provide a set of approaches and instruments to improve, shift the frame of or transform the core activities/ business of an organization, within the latter’s strategic objectives. #KNOWvember at CTA concluded with an Expert Consultation on ’The future of agricultural knowledge resource centres (Agri KRC)’. The highly anticipated event had around 40-45 people in the consultation from various backgrounds in research, extension, farmer organisations, policy organisations, value chain actors, librarians, information systems managers & experts in semantic web technology. Participants shared their interpretation of the term ‘Agri KRC’ – through a before and after comparison of personal definitions which indicated a change in personal interpretation as a result of their interactions during the 3 days. The last day of the consultation centered on discussing proposals by identifying areas for collaborative action, key performance indicators and impact pathways, resulting in establishing working groups for follow up – which may result in a policy brief on the issue of Agri KRCs. On the technical side, approximately 8 ideas were presented for joint initiatives to explore together with CTA partners –some of them more specific, targeting an external call for proposals which will be launched in January 2015, to more strategic approaches such as capturing local or indigenous knowledge and making them accessible through semantic web technologies. Participants were also presented the KM Tree as a framework for assessing KM within an organization, network or individual. CTA will shortly launch the personal KM scan. Finally, the CGIAR CGSpace Partners meeting was also held in Wageningen on 20-21 #KNOWvember, back-to-back with the Expert consultation. CTA has joined as a member of the CGSpace and is making its archived materials openly accessible through the CGSpace as a shared open platform.